Many ELLs are born in the U.S.A. Second generation students constitute 23 percent of the nation’s children and 75 percent of elementary ELLs. Nearly 7 percent of students in public elementary and secondary schools are children of illegal immigrants. Roughly three out of four children of immigrants — or 4 million — were born in the U.S. In 2003, 2.7 million children of illegal immigrants, or 63 percent, were born in this country. About 47 percent of illegal immigrant households have children, compared with 21 percent for U.S.-born residents and 35 percent for legal immigrants. The Supreme Court ruled in 1982 that ELL children — whether U.S. citizens or not — were entitled to a public school education. It is the law to provide ELL students with a quality public education. Mandatory in the legal system but not happening in the school. It is a well know fact that Latino children lag well behind white children in reading and math skills when they start kindergarten. Ell students are behind before they start. An educational system that does not – legally – address the educational needs of a group of students who are performing below other students their age. #1 – Increase parental involvement in the school. ELL students come from homes where both parents work, have not completed high school, and do not speak English. Parent involvement is critical for student success especially in formative years. #2 – Provide additional programs in under represented neighborhoods. Too few programs in the neighborhoods where ELL children live. Parents work, do not have transportation, and are forced to send children to early childhood and support programs far away from home. #3 – Increase Pre-K for Hispanics in their neighborhoods. Shortage of pre-kindergarten slots in Hispanic neighborhoods. The number of children exceed the number of programs. 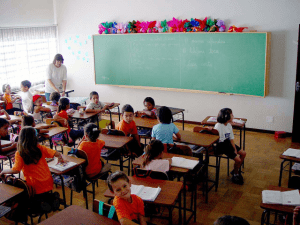 #4 – Hire more bilingual teachers. Language is one the most significant issues for immigrants. Low number of bilingual teachers in early childhood and elementary schools are out matched by the large number of young ELL students. Focus on parent involvement, neighborhood programs, Pre-K classes, and bilingual teachers and improve the quantity and quality of education for ELL students in your school and district.